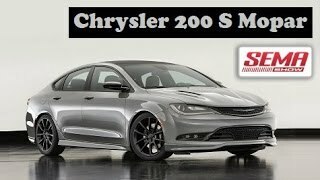 The Chrysler 200 Super S by Mopar is a rolling showcase for the latest Mopar exterior parts that will be available for the 200 sedan in 2012. The Chrysler 200 Super S by Mopar will debut at the Detroit Auto Show 2012. 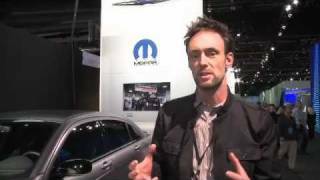 January 2, 2012 ,Auburn Hills, Mich. -	Chrysler Group LLC’s Mopar brand set its sights on the 2012 Chrysler 200. 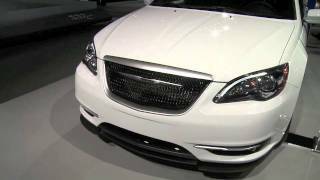 The Chrysler 200 Super S by Mopar is a rolling showcase for the latest Mopar exterior parts that will be available for the 200 sedan in 2012. The Chrysler 200 Super S by Mopar will debut at the 2012 North American International Auto Show. For Stage One, Mopar’s long list of modifications starts at the front of the car with a large chin spoiler, satin chrome fog light trim, satin chrome grille surround and mesh in the upper and lower grilles. The upper grille is gloss black with a recessed Chrysler wing badge. Body sides feature new side sills, satin chrome belt molding, black chrome “200” badges and gray or hyper black 18-inch “S” alloy wheels. Stage Two adds performance with a coil-over suspension, which also lowers the center of gravity for the vehicle. In addition, Stage Two includes a cold-air intake and cat-back exhaust. This Mopar package on the Chrysler 200 Super S will be available on Chrysler 200S later in 2012. Mopar’s Chrysler 200 Super S will be one many Mopar-modified vehicles that will debut during the 2012 auto show season. The 2012 Chrysler 200 sedan delivers exceptional value without compromise. With a sophisticated design, high-quality craftsmanship, technology that keeps passengers entertained and connected, the peace of mind having every available safety feature as standard equipment and a choice of powertrains that offer excellent fuel economy and exceptional power, drivers and passengers will not only enjoy the drive, but look forward to it. 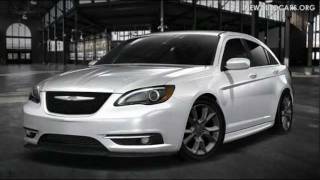 The 2012 Chrysler 200 is an exciting alternative for customers that want style and substance, all at a surprising value. The 2012 Chrysler 200 provides drivers an agile, confident, handling performance in all driving situations, whether it’s commuting to work, a weekend adventure on twisty roads or going out with family and friends. The 2012 Chrysler 200 is offered with the proven 2.4-liter World Gas Engine and is available mated to a four-speed or six-speed automatic transmission, for an exceptionally fun and fuel-efficient driving experience. The 2.4-liter I-4 engine produces 173 horsepower (129 kW) and 166 lb.-ft. (225 N•m) of torque and has an EPA estimated fuel economy rating of 21 miles per gallon (mpg) city and 30 mpg highway mated to the four-speed automatic transmission and 20 mpg city and 31 mpg highway when mated to the six-speed automatic transmission. The available 3.6-liter Pentastar V-6 engine, one of Ward’s “10 Best Engines”, provides an even more exhilarating driving experience that offers customers the best of both worlds – exceptional V-6 horsepower and fuel economy. The new 3.6-liter Pentastar V-6 engine is mated to the 62TE six-speed automatic transmission and produces 283 horsepower (211 kW) and 260 lb.-ft. (353 Nm) of torque. It has an EPA estimated fuel economy rating of 19 mpg city and 29 mpg highway. The 2012 Chrysler 200 sedan is available in four different configurations in the United States. The Chrysler 200 LX, 200 Touring, 200 Limited and 200S models are packed with style, innovative features and a dynamic driving experience, at an excellent value.